Sarah Laura Peyrel is currently representing Switzerland at the 2017 Miss Earth pageant in the Philippines. Know more about her in this exclusive interview. Until recently I played tennis professionally and as soon as I can find the time I will take a course which will certify me to pass my knowledge of tennis on to young and motivated junior players. I would say laughing is my beauty secret as I look prettiest when I am happy. It is difficult to describe a country because I believe you have to experience the culture and feel the atmosphere. Perhaps the most extraordinary aspect of Switzerland are the seasons. Depending on which season you plan to visit you will get a vastly different experience. In winter temperatures can drop well below freezing and visitors should expect a lot of snow, especially up in the mountains! Perfect for skiing and other winter activities! On the other hand in summer it can get quite hot, making a swim in one of the many clean lakes and rivers an extremely pleasant experience. 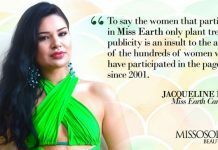 What is the most difficult thing you did to prepare for Miss Earth pageant? Finding the most important message I want to bring to all of you. There are an endless list of things I would like to change concerning the environment. However, it is neither possible nor effective to try and tackle all of those problems simultaneously. Therefore I would implement the step by step system to solve the biggest issue we are facing today: to raise awareness in stopping to destroy our planet. There is a saying in german, I try to translate it as well as I can. “Even if the world is going under tomorrow, I will still plant a tree today.” It symbolises hope even in the worst of times. Can you share with us your environmental advocacy? We have to finally wake up and help save our lakes, rivers, oceans and all of its inhabitants. We need to educate ourselves and others on the toxic pollutants that are constantly thrown into our oceans and the catastrophic consequences these carry with them. Not only to the marine life but also to ourselves. Unfortunately for us, what happens at sea doesn’t stay at sea. What do you think is the most important environmental concern that must be addressed right away? For me the environmental problem that should concern us most is the very foundation of life, our water. We can’t live without it and although most of the planet is covered by it, we face many major problems when it comes to sustaining life. About one fifth of our population live in areas where clean drinking water is a scarcity and it is in those areas where great improvements in infrastructure need to be made, to both ensure drinking water and in cases of wastage, pollution and drought. However, do not think that these concerns are limited to our population. These problems affect both fauna and flora alike, especially marine life. Whether it’s pollution from our industry, drilling for oil, or simply from dumping plastic in the ocean we are increasingly adding toxic pollutants to our oceans, our seas and our rivers. It should therefore come as no surprise that the inhabitants of those waters are suffering enormously and it is up to all of us to help. People accusing Miss Earth as a pageant that is only about planting trees for publicity. How can you prove them wrong? Well what are Miss Earths if not messengers for the environment? We carry the ideas and hope to people. By planting trees we set an example for everyone to take the opportunity to take part in saving our planet. I have helped planting over 300 trees across of Switzerland. If everyone would do only a fraction of that across the globe imagine how much we could accomplish. The most effective way of proving them wrong is to show those people exactly what it is the misses do during their year. By showing them just how much influence and impact their actions have on the world will not only prove them wrong but may even persuade them to join in saving the planet as well! 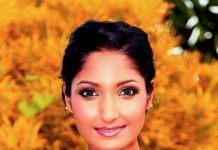 Among the Miss Earth winners since 2001, to whom do you look up to as your role model? Out of all the Miss Earth winners, the person I look up to most is Katherine Espín for her environmental advocacy. Perhaps the most important and effective ways we can teach others about the importance of climate change and how necessary it is to be environmentally conscious is to start at a young age. When we show children in schools how to live an environmentally friendly lifestyle, they will grow up keeping that way of life close to their hearts. Finally a message to all of your fans at Missosology? Keep on learning and always carry with you the awareness of protecting our planet. Don’t be discouraged even if you don’t see an immediate effect your efforts are making in protecting the environment. Good things take time and it is up to each one of us to work together in creating a ecological lifestyle. One small raindrop makes little difference to the pond, however with enough of those droplets we can fill that pond right up!. Together we can make a difference!